Are you a client of any of the banks? Here is a list of things you will need to know. 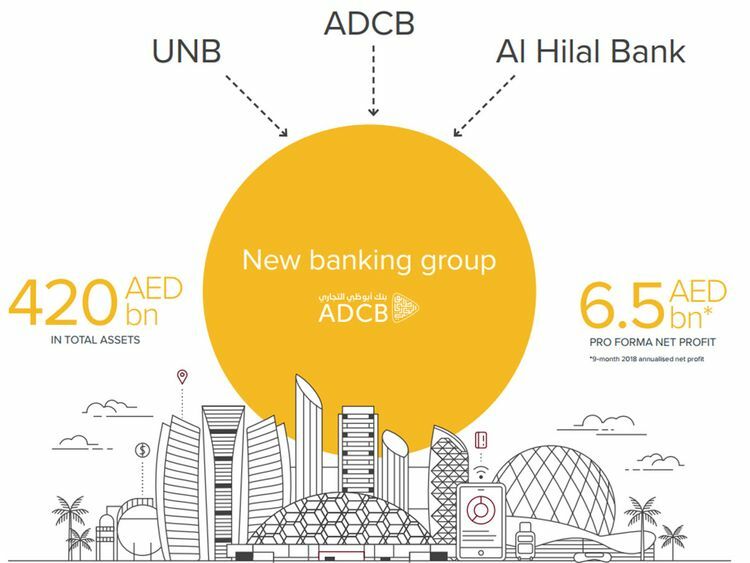 The official website of the three banks ADCB, UNB and Al Hilal which are expected to finalise their merger by mid 2019, has published answers to some of the most frequent questions being asked by their customers. 1. What does this mean for me and my bank account, credit card, mortgage or other products? Will I see changes in the terms and conditions of my products? Your banking products and services will continue as usual, with the same terms and conditions. Continue to bank through same relationship managers, branches, contact centre and mobile and online banking platforms. 2. Will the online banking system or mobile apps change? No, please continue to use the online banking platform and mobile apps as usual. 3. Will my account transfer over to the new bank, and will my account number change? 4. Will I have a choice from the full range of products and services provided by all banks? The banks continue to operate separately for now. One of the benefits of the merger is that we will be able to offer an enhanced range of products and services in the future, ensuring that you benefit from access to best-in-class banking. We will inform you well ahead of time when the banks will legally merge, and of the full range of products and services on offer following the merger. 5. Will services be interrupted as a result of the merger? Once the merger happens, we will be integrating the organisations gradually, in a stage-by-stage manner, and will do everything we can to ensure this is a smooth process. We will inform you well ahead of time of any significant changes or temporary pauses in service that are needed as we integrate our systems. 6. If I have loans or credit cards from more than one of the banks, would that impact my credit limits? Until the merger is effective, there will be no impact on your credit limits. Following the merger, we will assess matters such as credit limits on a case by case basis, in compliance with UAE banking regulations. If any changes are necessary, we will work closely with you to support your requirements. 7. Will there be changes to my local branch, or will it close down? Please continue to visit same branches as before, as there are no changes to the services provided. Once the merger is completed we will assess the combined operations of the three banks, and ensure we maintain an optimised branch network to meet our customers’ needs. We will inform you in good time if there are any changes that impact you. 8. What will be the name of the new bank? 9. As an Islamic banking customer, what does this mean for my services? Will I become a customer of Al Hilal Bank? This transaction reinforces our commitment to providing high quality Islamic banking services. As a result of the acquisition of Al Hilal Bank, which will operate as a separate entity, the new banking group will be the third largest Islamic banking franchise in the UAE. Customers will benefit from a distinctive offering with a wide range of Shari’ah-compliant products and services. Al Hilal Bank will retain its existing name and brand, and will continue to operate as a separate Islamic entity within the new banking group. 10. Will I still have the same relationship manager? Your relationship manager remains the same and is available to talk if you have any questions about the merger, or about how the bank can support your needs. Please also continue to bank as usual through branches, contact centres and mobile and online banking platforms. 11. If I have questions, who can I call? Our relationship managers, branch staff and contact centre are always happy to talk to you about your banking needs, or any questions or concerns you may have. 12. Can I make deposits or payments to my accounts from the branches of any of the three banks? Before the transaction is completed, the banks continue to operate independently. Please continue to use your usual banking services as you have previously. Once the banks legally combine, we will communicate any changes to you, including the benefits of a wider range of products and services. 13. Will my personal data be shared with the other banks involved? Once the merger happens, data at all three banks will come under the remit of the combined bank. We maintain strict compliance with all relevant regulation on data and have strong systems in place to ensure that your information is safe with us.